Spasmodic Dysphonia is a neurogenic phonation disorder.At this time, there is no cure for Spasmodic Dysphonia. Therapy is aimed at improving vocal quality and reducing the compensatory strategies the client may be using. 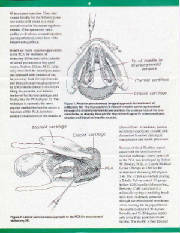 An old and controversial treatment included surgical cutting of the recurrent laryngeal nerve to paralyze one vocal cord. Although initially good results were reported, follow up revealed a return of voice symptoms within 6 months to 6 years of surgery in 2/3's of the cases and a number of these clients were worse than before surgery. Bilateral Medialization Laryngoplaty: This procedure can push the vocal folds together thus eliminating the air wastage that is the result of abductor spasmodic dysphonia where the vocal folds open too much. Although the surgery is unpredictable, it can improve fluency but can reduce pitch and loudness. It is not a permanent change as Improvement (if there is any) does not last for more than 5 years. Vocal Fold Thinning: This "myectomy" procedure removes the lateral portion of the vocalis muscle using a CO2 laser. De-Re stands for denervation-reinnervation. This operation changes the nerve wiring of the larynx. It cuts the lateral cricoarytenoid and thyroarytenoid nerves and reinnervates other nerves by suturing in place to prevent Spasmodic Dysphonia from recurring or atrophy of the muscles. This operation has the potential to be a permanent cure. It is recommended for patients who suffer from adductor Spasmodic Dysphonia but not for patients who suffer from abductor Spasmodic Dysphonia. 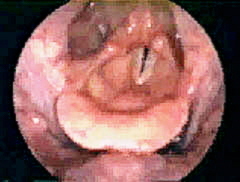 Cutting of the nerves resluts in loss of voice for approximately 1-3 months, but the voice returns as the nerves heal. Lipoinjection: This procedure involves injections of adipose tissue in the vocal folds. 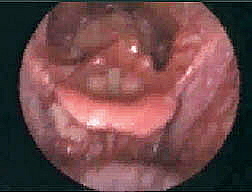 This tissue adds to the thickness of the vocal folds so approximation can be achieved. 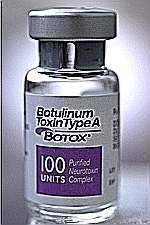 No incision has to be made and it has the added advantage of making Botox injections less frequent. Although the SLP serves a secondary compensatory role, the following strategies may be useful to the SLP to help their client the best voice possible. *Relaxation Techniques would include progressive relaxation of the body, neck, then larynx and/or laryngeal massage to facilitate relaxed phonations that are generalized in to words, phrases, then sentences. *Breath control techniques would target the client maintaining a steady flow of air from the lungs during voice production. *Loudness modifications may be helpful to minimize stress on the larynx. *Counseling is sometimes required when the client is having difficulty accepting the disorder and coping techniques are required or who fear that the disorder threatens their occupation. *Chewing technique can be taught to obtain muscle balance in the vocal mechanism. First, the client cjews in a relaxed, open-mouthed, exaggerated way. They are instructed to pretend they are moving food around in their mouth with exaggerated movements of the tongue. After this is accomplished, the client is asked to phonate softly. Then, they inhale deeply and chew and phonate on outgoing air stream using erratic variations in pitch. Then, they are instructed to chew, phonate, and articulate 2-3 word combinations that begin with vowels (I am over, I am in, I am on). After accomplishing this step. the client does practice drills using sentences at various pitch and loudness. Daily practice is encouraged. *Chanting is introduced by playing a recording of a chant or modeling one. The client will practice using the chant voice and normal voice alternately and work towards voice production with a soft glottal attack. *Yawn-sigh begins with demonstration of a prolonged yawn and producing a gentle voiced sigh during exhalation. The client will model this several times. Then, the client will say /ha/, /ho/, /hu/ with easy onset. Finally the client will eilminate the yawn and produce syllables, then work to words, phrases and sentences. *Biofeedback-the client is recordes. After chosed techniques are preformed, the client is recorded again. The client learns to make adjustments through listening. *Relieving communicative stress-ie: using a voice amplifier when talking on the phone. *Use /h/ phonation-instruct client to start their voices using /h/ phonation. *Warm up voice in the morning. Start with relaxed humming for 2-3 minutes. Sing a relaxed scale of "raspberries". Then make lip trills in a midrange for 2-3 minutes. *For abductor spasmodic dysphonia, humming activities may be helpful to place the voice in the facial mask and remove the effort from the larynx. *Singing can be very helpful. The motor programming for singing is different from that of speaking. Singing exercises can release some of the tension and stiffness in the neck and chest causing a more relaxed voice. Treatment for spasmodic dysphonia is designed to help lessen the symptoms of the vocal spasms and improve the quality of the person's voice. There is no known cure at this time. Most therapies are attempts to lessen the impact of dystonic spasms. No single strategy will be appropriate for every case. The goal of any treatment is to achieve the greatest benefits while incurring the fewest risks therby allowing the client to lead a fuller, more productive life by reducing the effects of spasmodic dysphonia. Establishing a satisfactory regimen requires patience on the part of both the affected individual and the clinician to develop a plan for the benefit of the client to maximize the client's voice. (Yorkston, 2003).